Despite running a demonstration on the coldest days of the year scores of passers-by checked out PBS bikes for a spin around University City and Logan Square. As a bonus close to two hundred people attended the Streetfilms Movie Night at the Academy of Natural Sciences. 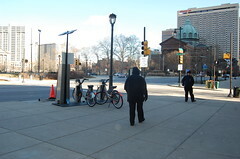 Attendees included Councilwoman Blondell Reynolds-Brown, State Representative Babette Josephs, NE Philly Chamber of Commerce President Al Taubenberger, former Streets Dept Engineer/bike lane champion Tom Branigan and Philadelphia Pedestrian Bicycle Coordinator Charles Carmalt. Thanks to our new friends at Streetfilms - Lily Bernheimer, Clarence Eckerson Jr., Elizabeth Press and Robin Smith. Also thanks to the representatives from Public Bicycle Systems in Montreal and Minneapolis for standing in (and bringing us) the cold and finally Neighborhood Bike Works for providing valet bike parking. Philadelphia can be the "Greenest City in America" by starting a bicycle sharing program and improving our bicycling infrastructure. Send a Letter to Mayor Nutter!